Tattoos and politics certainly make strange bedfellows. As our presidential campaign moves into new stages of mud slinging at each newscast, it brings to mind the infamous 1884 election. Many election watchers consider it, as America's "vilest" presidential campaign. That race was in November 1884, between State Governor Grover Cleveland and Congressman James Blaine. Cleveland had dallied with a widow and refused to marry her when she became the mother of his child, and Blaine had taken gifts from businesses and lied about them. The choice, as a local paper put it, was between a private immoralist and public immoralist. 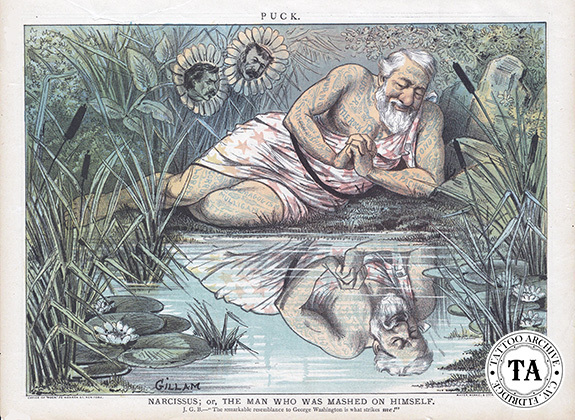 Then enters Bernard Gillam, a political cartoonist working for Puck, an independent Republican weekly. Having a strong anti-Blaine line, Puck commissioned Gillam to do a series of drawings showing Blaine's political no-nos tattoos as words on his body. It was no coincidence that the Blaine in these drawings resembled the famed tattooed Greek, Constantine. The National Democratic Committee ordered huge stacks of these issues and distributed them as campaign literature. This helped push Puck's sales to new heights. Much to everyone's surprise, the tattooed images of Blaine stuck in the voter's minds. This was long before our modern "Teflon" candidate. For the rest of the campaign these issues dogged Blaine, and in November 1884 Grover Cleveland became the 22nd President of these United States. It just goes to show that even more than one hundred years ago, Americans could live with sexual misconduct easier than with political wrong doings.